Aisling Annacotty AFC - At The Heart of The Community! Aisling Annacotty AFC. as we know it today is an amalgamation of two clubs, Aisling FC, and Annacotty FC. This amalgamation took place in 1988 when representatives from both clubs decided that it was to the benefit of the clubs to unite to form a larger single club, to promote the development of schoolboy and junior soccer in the greater Annacotty area, which at the time was seeing a rapid growth in employment and population. 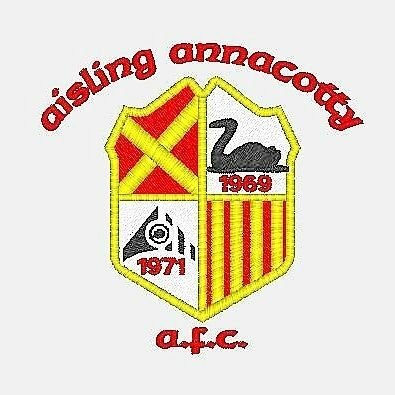 Today Aisling Annacotty AFC is one of the largest soccer clubs in Ireland, having in excess of 900 members and fielding teams from under 6 to under 17, youth and adult ladies and men’s teams. However it was from more humble beginnings that the club was formed. Aisling FC was formed in 1971, when a group of individuals, who enjoyed their Saturday game of cards and a pint in the Regal Public House in Cecil Street, Limerick, decided to form a team called Regal United. Initially their intention was to play other public houses and businesses in friendly matches. However in the Autumn of 1971, on having their application accepted by the Limerick District Management Committee they entered their first team in Division 4 of the Limerick District League. On entering the league the club changed its name to Aisling F.C. Familiar names in the early years were Tony Hurley, Jack O’ Hurley, Mick Patton, Paddy Carroll, Liam Hanly, and Frank Bouchier, many of whom both graced the playing field and held administrative and coaching positions, within the club over the years. The club’s first Hon.President was Cllr. D.A. O’ Driscoll, the then Mayor of Limerick. It took the club only ten years to reach the lofty heights of premier league status, having won the 4th Division, 3rd Division and Saxone Cup (twice) along the way. 1980 saw the club enter a minor team to the league, followed in 1981 by a second Junior team in Division 3 of the league. Again it did not take long for honours to follow with the minor team winning the league and cup double in the 1984/85 season and the minor cup again in 1989/90. The club originally played their matches from a rented pitch in Singland, Ballysimon, Limerick but in 1983 took the major step of purchasing their own pitch at Aisling Park., Rathuard, Co. Limerick. Annacotty Football Club was formed in 1969 by Eamon Cosgrave, Paddy Pond and Pat Bermingham and competed successfully in the Eastern Section of the Limerick League for many years, winning this section in the 1971/72 season. Aisling Annacotty Football Club, following the amalgamation, continued where the original clubs left off by enjoying considerable success on the junior soccer front, twice winning the Murphy cup and Division 1A of the Junior league. In recent years the club progressed to the quarter finals of the FAI Junior Cup. The Junior “A” team are currently competing successfully in the Premier League. It is however in the schoolboy and schoolgirl sections, that the club has enjoyed enormous success in recent years, winning numerous underage leagues and cups. For example, in the season ending 2018, 26 competitions were won by the club overall. The underage section of the club was formed in 1981, and was formally known as Plassey United. In 2004 the club purchased its current pitch in Annacotty from the Limerick County Council, and also disposed of its pitch in Rathuard. Over the years a considerable amount of money has been invested in the Annacotty pitch to get the playing pitch to a satisfactory standard and also on the building of dressing rooms and meeting rooms.In 2008 a further extension took place with the addition of two more dressing rooms. The newly refurbished dressing rooms were officially opened by the Minister of Defence, Mr. Willie O’ Dea on 5th September, 2008. As of late 2018 there are advanced plans to further develop playing, dressing rooms, meeting areas, shop and community room on the club grounds. Celebrating 20 years in soccer, the club is thriving with a long tradition and sprinkled with characters, amusing anecdotes and has competed over the years with an abundance of success. Over the years the club has produced outstanding players, some of whom have gone on to gain inter league, inter provincial, schoolboy international, schoolgirl international, and junior international honours. Today, by following an ethos of encouragement, equality and participation we provide an environment to enable all players to develop their potential. As a club we are investing a considerable amount of time and resources in developing our coaching programmes for both players and managers. Embedded in the club is a full time football academy.